EA Sports Active NFL Training Camp is an exercise game for Wii that merges the established momentum that the EA Sports Active franchise has created in the genre with realistic NFL training camp routines to create the most challenging and focused exercise game developed to date. Game features include a full range of exercises developed with the input of actual NFL fitness and conditioning trainers, a 60-day exercise challenge, total wireless body tracking via included additional sensors, a built-in heart rate monitor, included resistance bands for strength training, two-player support and more. EA Sports Active NFL Training Camp includes over 70 drills and challenges designed to improve strength, power and conditioning, as well as reaction skills, agility and first step quickness. Track your heart rate on screen in real-time with the innovative EA Sports Active NFL Training Camp heart rate monitor to capture intensity and optimize performance over time. 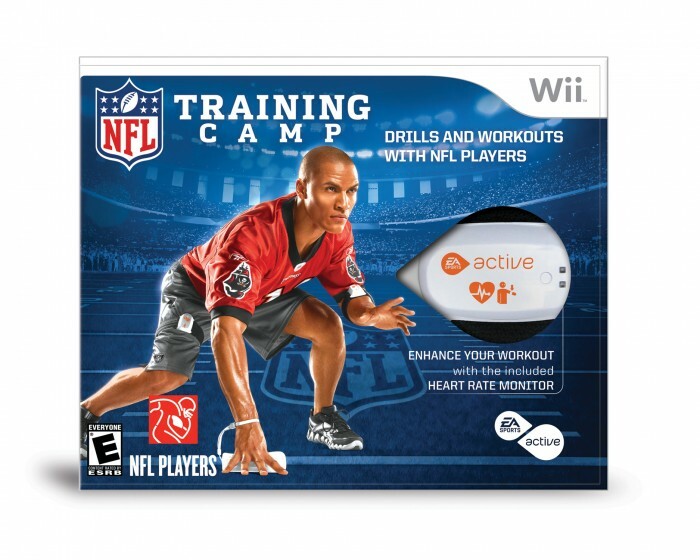 The EA Sports Active NFL Training Camp Total Body Tracking wireless system uses motion sensors in leg and arm straps along with the Wii remote to register movement and provide complete freedom of motion. Pick your favorite team, step into a stadium and train alongside your favorite players. Add new challenges to your performance with the Wii Balance Board. (Balance Board not included). Football fans with a passion for the game can experience this new Wii exclusive fitness game. Work out in your favorite stadium with coaches and even NFL players wearing customized gear. Educate yourself in the system first (EA Active, More Workouts, and Active 2 users have an advantage here). Achievements (124 total), special videos, pro shop points (for gear, themes, stadiums, etc. ), and statistics give a nice accomplishment level more while the considerable variety keeps workouts fresh. Players can also check their draft ranking that begins in the seventh round then rises with progression. The controls include the remote, the balance board (additional challenges), and the wireless total body tracking system. This surprisingly comfortable system was designed by certified personal trainers and NFL strength and conditioning coaches. Check the “how to use” in the equipment videos for correct placement. These videos need more deliberate instructions about where the remote should be placed in each exercise session. Help and settings can be found in the main menu or when pausing the game. 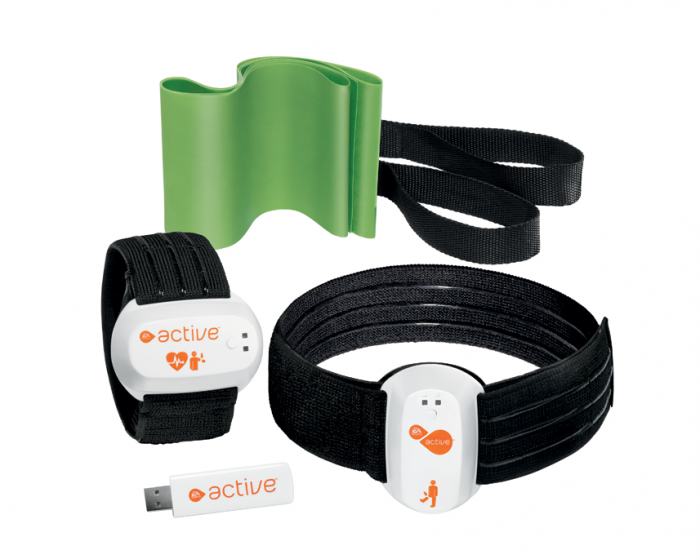 The EA Active USB receiver allows EA Sports Active NFL Training Camp to accurately measure heart rate, calories burned and provide wireless motion tracking. This USB receiver cannot be used as a regular flash drive. The leg strap sensor goes on the right thigh, which regulates the vertical level of your thighs. The other sensor, which includes the heart monitor, attaches to the left arm. These sensor have an indicating light for the first or second player that also serves as a power indicator too. The natural rubber latex resistance bands attach to two black straps to regulate upper body exercises. Resistance bands with built-in handles are also available for $9.99. Players can choose easy, medium, or hard levels and check adjusting onscreen messages if movements do not matching desired results. The movements register very well overall and take some minor adjustments in different areas, especially the arm curling exercises and linebacker tackle drills. Players enter your weight manually or weigh themselves on the balance board for a more accurate reading. Players can create a maximum of five profiles then shape a realistically animated character – male or female. The jersey name is limited to eight characters. The virtual trainers (five special players from each team) and coaches guide your progress. Players can also log progress in a journal, use statistical fitness tools and take special surveys. Exercises concentrate on upper and lower body and include plenty of cardio work, so the excitement level stays high as players can tackle tough workouts individually or with a friend. Players can also create a custom workout including warm up and cool down exercises. Players can go head-to-head in multi-player mode or take the unique NFL Combine 60 Day Challenge. Workout modes includes collection (preset and custom) and generator (based on input auto generated), which cannot be saved – “it’s just for your immediate workout needs”. The online mode connects players right away or plugs them into a workout group, which compares progress beyond the basic statistics and scoreboards. Graphics are colorful, but not detailed. The stadium setting is good, but more interaction up in the stands would be great. Some clipping still occurs, especially when trainers hold stretches and audio prompts occasionally do not match (e.g. players are told to stand straight when they are sitting down). The familiar NFL Films music enhances the experience while a workout jukebox would have been a nice customization option. This fitness game has great themes that promote healthy activities, motivation, goals, and rest. Football fans have an obvious high interest while this game can also attract fitness fans looking for some cross training opportunities. Clear instructions, instant feedback, meaningful encouragement, and valuable tips help you achieve maximum results. Important health considerations like rest periods, stress levels and eating habits create a well-rounded program. What I Like: heart monitor included, USB use, cross training opportunities, continues EA Active game series, incorporating real exercises outside this game. What Needs Improvement: touchy controls on the curl exercises and tackling segments, a helpful buffer would help some action timing issues. 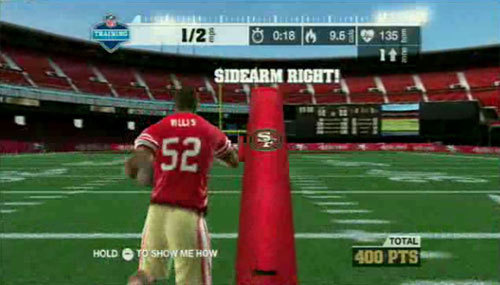 Football fans with a passion for the game can experience this new Wii exclusive fitness option. Work out in your favorite stadium with coaches and even NFL players wearing customized gear. Educate yourself in the system first (EA Active, More Workouts, and Active 2 users have an advantage here). Achievements (124 total), special videos, pro shop points (for gear, themes, stadiums, etc. ), and statistics give a nice accomplishment level more while the considerable variety keeps workouts fresh. Players can also check their draft ranking that begins in the seventh round then rises with progression. The EA Active USB receiver allows EA Sports Active NFL Training Camp to accurately measure heart rate, calories burned and provide wireless motion tracking. The leg strap sensor goes on the right thigh, which regulates the vertical level of your thighs. The other sensor, which includes the heart monitor, attaches to the left arm. These sensor have an indicating light for the first or second player that also serves as a power indicator too. The natural rubber latex resistance bands attach to two black straps to regulate upper body exercises. Resistance bands with built-in handles are also available for $9.99. Players can choose easy, medium, or hard levels and check adjusting onscreen messages if movements do not matching desired results. The movements register very well overall and take some minor adjustments in different areas, especially the arm curling exercises and linebacker tackle drill. Graphics are colorful, but not detailed. The stadium setting is good, but more interaction up in the stands would be great. Some clipping still occurs, especially when trainers hold stretches and audio prompts occasionally do not match (e.g. players are told to stand straight when they are sitting down). The NFL Films music enhances the experience. High interest and attract fitness fans looking for some cross training opportunities. Clear instructions, instant feedback, meaningful encouragement, and valuable tips help you achieve maximum results. Important health considerations like rest periods, stress levels and eating habits create a well-rounded program. What I Like: heart monitor included, USB use, cross training opportunities, continues EA Active game series, incorporation of NFL PLAY 60 and other real exercises outside the game.